2013 Outlook: Jason adds another left-handed, workhorse arm to our rotation. He doesn't feature strong strike out totals but he compensates by limiting walks and hits. He features one of the best change ups in the game which can really force batters to make weaker contact. Using the change up is part of the reason that Vargas has been able to pitch so many innings consistently over the last three years. Moving Vargas to Anaheim switches one pitcher's park for another. However what has changed is the defensive arrangement playing behind him and the move to Anaheim should benefit a fly ball pitcher like Jason. Last season Vargas was really able to reduce the hits and walks he gave up; however he did give up an unusual amount of jimmy-jacks. In 2013, what you see is what you will get with Jason: An innings eater, fly ball pitcher who will give our powerful offense the opportunity to win games. Vargas is a competitor and although he is not the flashiest pitcher in the Major's he is reliable and can buckle down when things get tight. 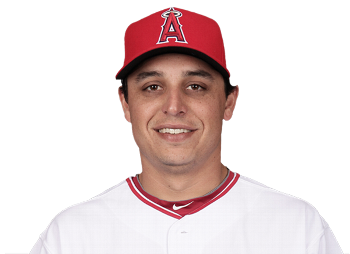 Oh and don't forget that he is a former Dirt Bag, like Weaver, and how can any team not make the playoff's with two Cal State Long Beach grad's towing the rubber?